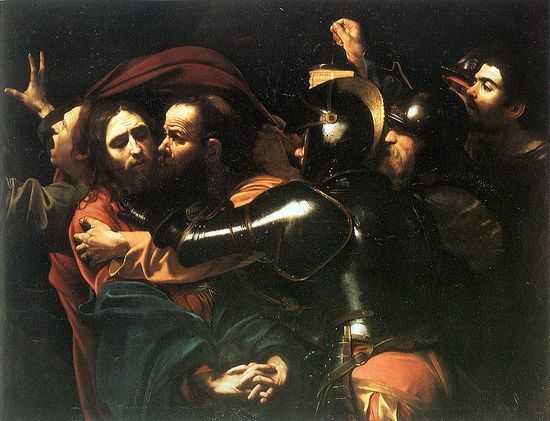 While he was still speaking, Judas, one of the Twelve, arrived. With him was a large crowd armed with swords and clubs, sent from the chief priests and the elders of the people… Jesus said [to Judas], “Do what you came for, friend.” Then the men stepped forward, seized Jesus and arrested him. With that, one of Jesus’ companions reached for his sword, drew it out and struck the servant of the high priest, cutting off his ear.“Put your sword back in its place,” Jesus said to him, “for all who draw the sword will die by the sword. He then heals the wound created in self-defense. The whole point of Christianity, on a personal level, is a refusal to use violence even in self-defense and even when one’s own life is threatened. For centuries, this radical nonviolence was celebrated by the church in its canonization of martyrs who chose to be mauled alive by animals than submit to the civil order’s paganism. Martyrdom was the first and ultimate form of nonviolent resistance to injustice and, like the Christian-rooted civil rights movement or Gandhi’s campaign for independence, it was precisely this staggering refusal to defend oneself, the insistence on being completely disarmed, that changed global consciousness. It was what made Christians different. It’s what made Martin Luther King Jr different. To use Jesus as an advocate of armed self-defense is almost comical if it were not so despicable. In my view, Jesus should not be dragged into any of our current policy debates. The issue of gun control in this country at this time is complex and worth debating in civil and secular terms. I think we can make things a little safer, but given the ubiquity of guns and the Constitution of the US, I wouldn’t expect much that doesn’t end up making things even worse. Bishops who pontificate on this in political contexts are equally violating Jesus’ apolitical spirit.